On a recent trip to World Market, I picked up some mulling spices for apple cider. I ended up using some to experiment with cookies. They came out pretty good, but I think I need to do some further experimentation because they could be better. Perhaps I’ll add a caramel glaze or filling next time, or maybe bits of apple or nuts! Preheat oven to 400 degrees and grease 2 cookie sheets. Sift dry ingredients together making sure there aren’t any clumps of brown sugar. Add wet ingredients and mix everything together until the dough is smooth and free of any lumps of sugar or margarine. 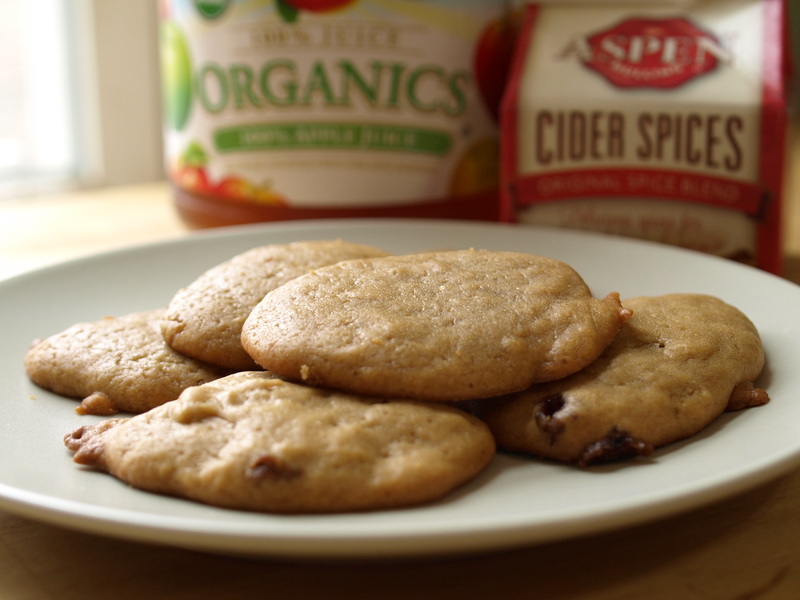 Once your dough is ready, place rounded spoonfuls of it onto your cookie sheets. Bake for 20-25 min until edges are lightly browned. I got an ice cream maker for my birthday this summer and this was one of the flavors I made that I really liked. 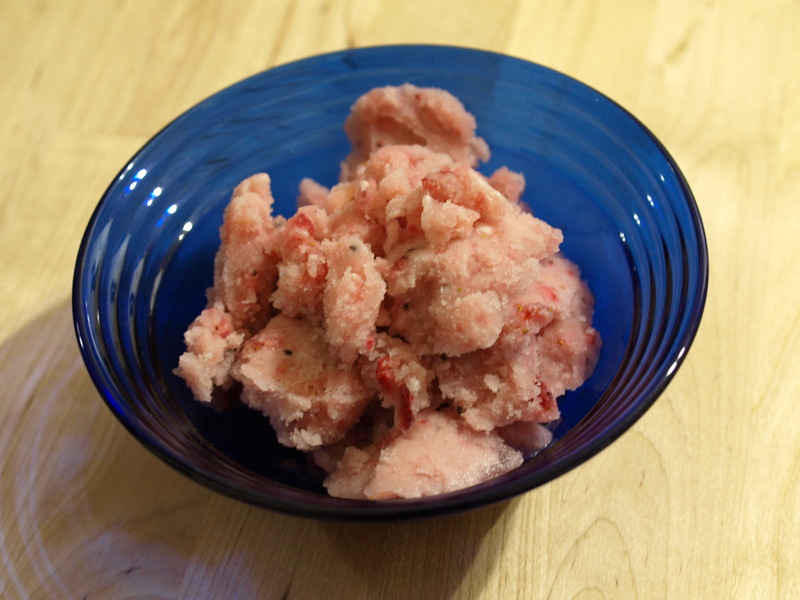 It’s more of a sherbet than ice cream, because it isn’t very creamy due to it’s low fat content. Even though summer is over, it was unseasonably warm today and it’s supposed to be warm for the next few days, so break out your ice cream maker and give this a try. Blend all ingredients in a blender and then slowly pour into the bowl of your ice cream maker as it spins until it’s as solid as you want it. Makes a little over a pint. A couple of weeks ago a friend of mine hosted a torta tuesday night at his place. I love tortas and it led to me making tortas of my own at home a few nights later. For those who don’t know, a torta is a Mexican sandwich served on a white roll called a bolillo. They can be served warm or cold and you can fill them with pretty much anything, though traditionally they are spread with beans and mayo or margarine, then filled with the toppings of your choice. 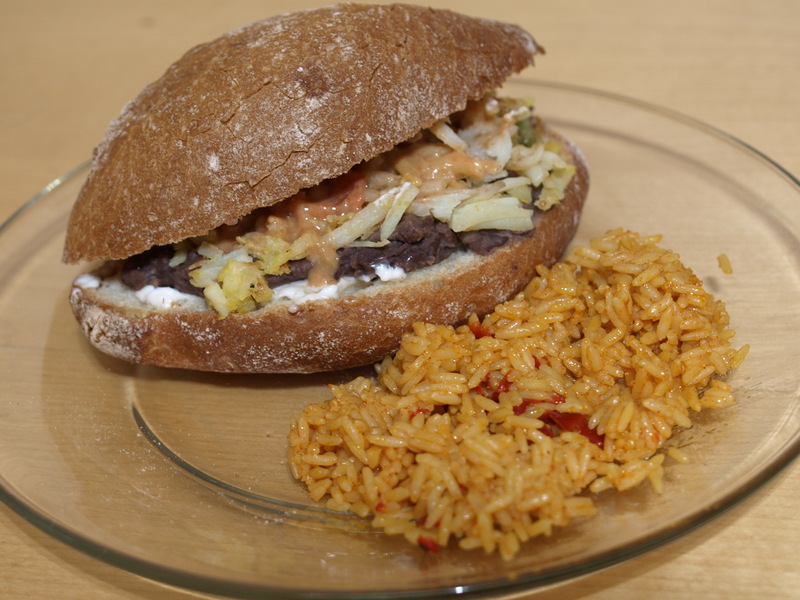 Here’s what I came up with – a potato and cheese torta, which I served with Spanish rice – it was delicious! Vegan bolillos or sandwich rolls, I used some nice ciabatta rolls for this one. Drain the can of black beans, leaving about a spoonful of liquid in with them and place in a small sauce pan. Turn on medium heat and the mash the beans with a potato masher until they form a thick paste then set aside. Meanwhile cut your bread in half and toast on a pan or in a toaster oven. 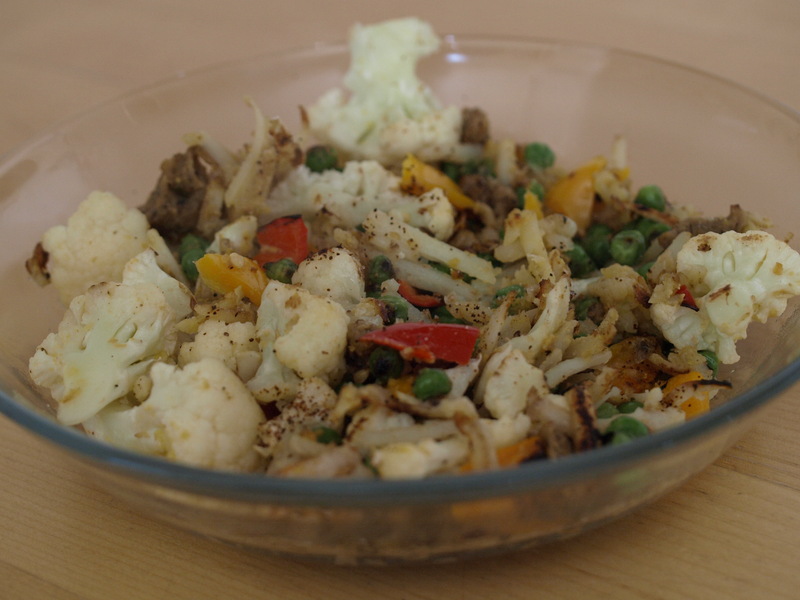 Pour 1 Tbsp olive oil into a medium skillet, as well as the frozen hashbrowns and cook until golden brown. Add chopped jalapeno and salt to taste. Meanwhile spread mayo and black beans onto your roll. Pour on hashbrowns once they’re done and top with Nacho Mom’s Fire Roaster Queso. Like any sandwich, tortas are super versatile, so go wild and top it with whatever your heart desires. Other good torta toppings: Upton’s chorizo, avocado, lettuce, tomato, roasted peppers and onions, Daiya cheeses, etc. What are your favorite torta toppings? Tostadas are one of my favorite things to eat during the summer, but sometimes I get tired of the traditional toppings (potato, carrots, etc. ), so I decided to shake things up a bit. Sautee the green onions in olive oil, add bell pepper and tofu once onions are translucent. Fry until tofu starts to brown, add jalapeno, spices and water. Stir and simmer until water evaporates. Pour black beans into a medium sauce pan with half of their juice from the can (drain the rest) and place over medium heat. Mash beans with a potato masher until they are smooth. 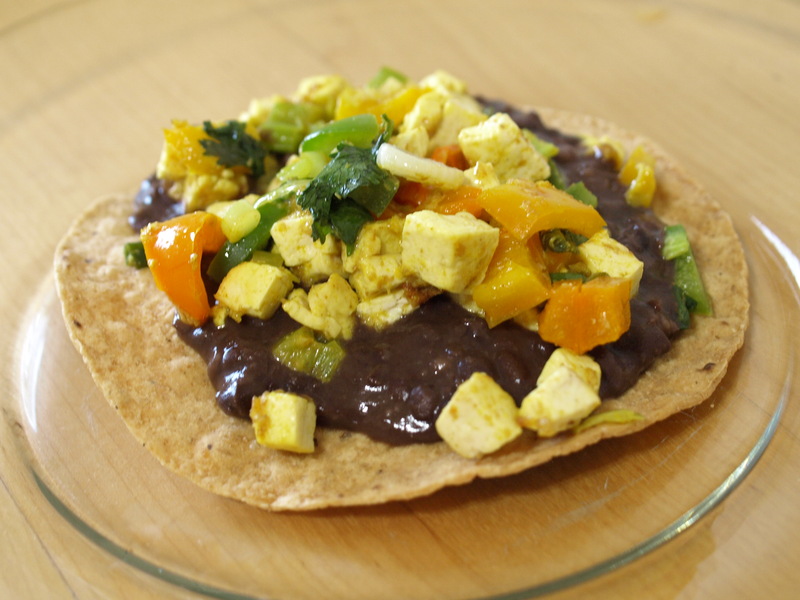 Spread beans on tostada and top with curried tofu. The tofu has enough flavor to be served as is or you can add sour cream and a salsa of your choice. I must admit that when I first flipped through Hannah Kaminsky’s latest book, I was a little skeptical, despite it’s enticing cover and photographs. 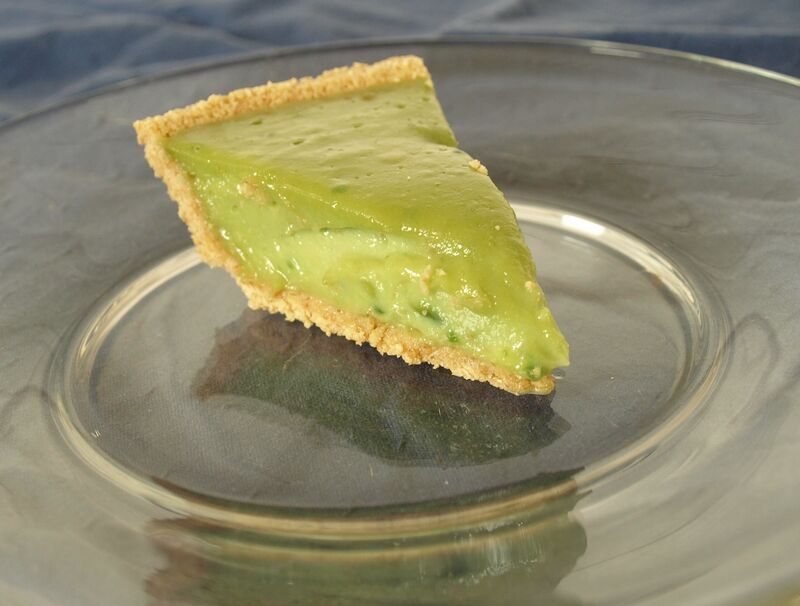 Avocado in a pie? Basil in cookies? Olive oil ice cream?!? I was mildly terrified, but decided to be adventurous and chose 4 recipes to test – 3 adventurous ones and 1 safe one; just in case the rest failed. I went with the Avocado Creme Pie, Mexican Chocolate Creme Caramel, Sweet Basil Shortbread Cookies, and my safe choice was the Marbled Chocolate and Zucchini Bread. I lined up several recipe testers: my friends Dan & Amy, Nick, our roommate, Tyler, and, of course, myself and spent a weekend baking. I was pleasantly surprised by the results. The Avocado Creme Pie was cool and creamy and the avocado flavor wasn’t overwhelming (which was a plus in my book, because I’m not a huge avocado fan so I only eat it in small doses), the Mexican Chocolate Creme Caramel was incredibly rich, the Sweet Basil Shortbread Cookies were a unique twist on an old favorite and the Marbled Chocolate and Zucchini Bread was moist and absolutely delicious! I had all of my testers try every dessert, but the Mexican Chocolate Creme Caramel, because half of it was a failure and half of it came out great, so there wasn’t enough for everyone. The common consensus (3 out of 5) was that the Avocado Creme Pie was “Amazing!” Tyler was so into it he probably could have eaten the entire pie by himself! 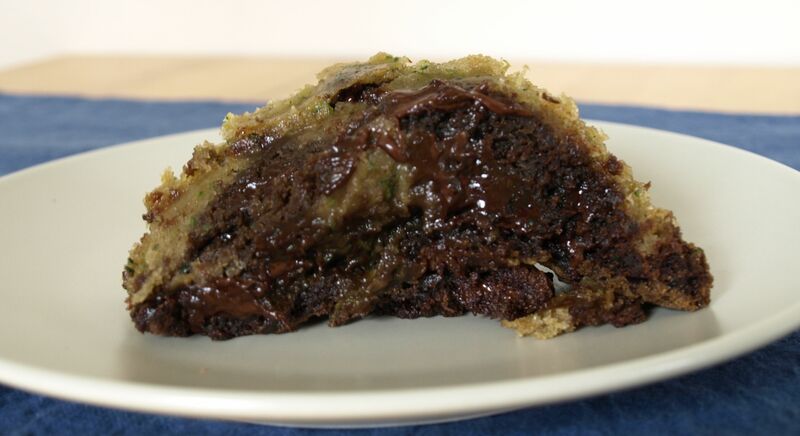 The second most popular item was the Marbled Chocolate and Zucchini Bread (recipe after the interview with Ms. Kaminsky! ), which was my favorite. The Mexican Chocolate Creme Caramel was only tested by Nick and myself; we both thought it was rich and delicious, though a little grainy (perhaps I need to blend the tofu longer next time). 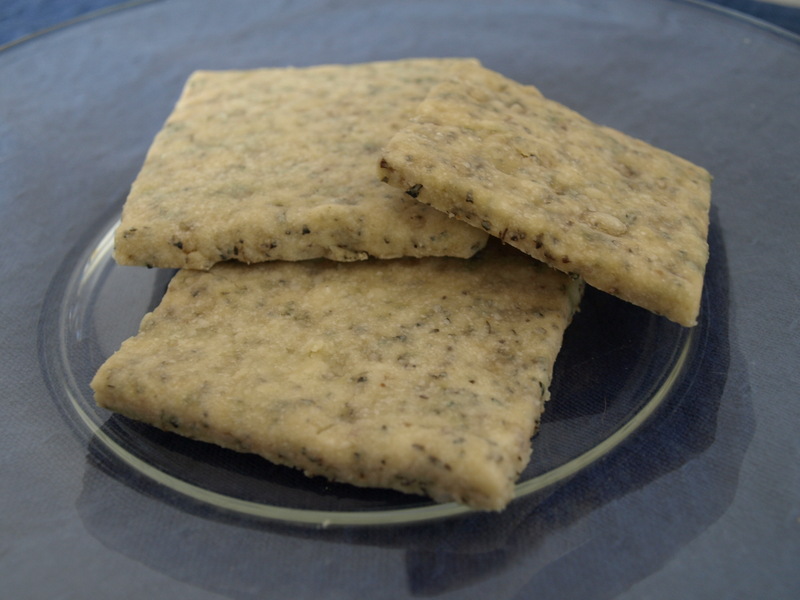 The underdog was the Basil Shortbread Cookies, I enjoyed them, but no one else was a fan. I must admit I was forced to use dry basil in them because I couldn’t find any fresh basil anywhere, so they had a vague tea-like quality. I want to give them another chance and try them with fresh basil, like the author intended. 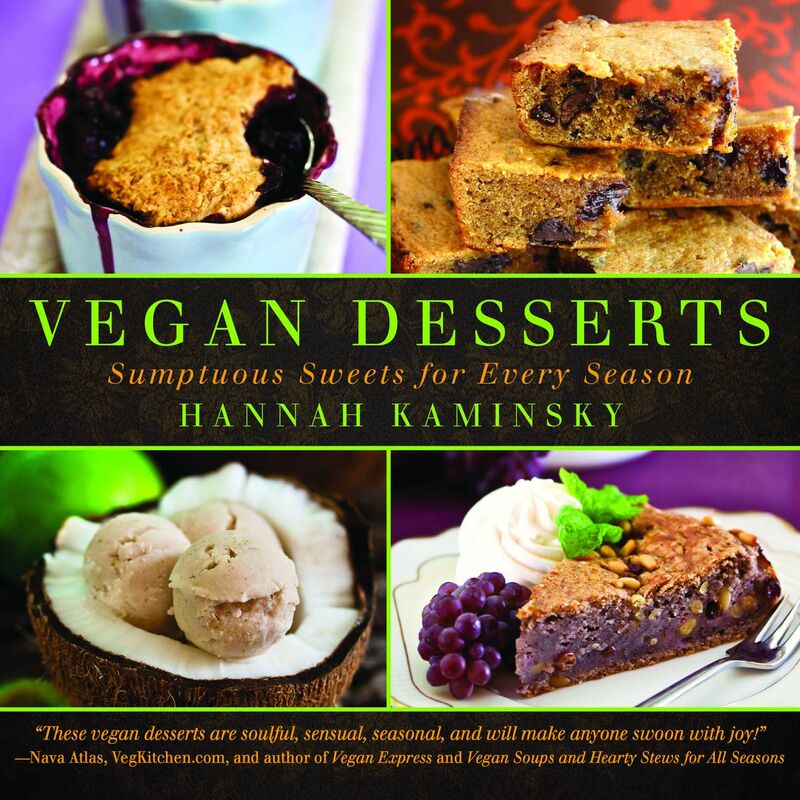 All of the recipes I chose were from the Spring section of Vegan Dessert: Sumptuous Sweets for Every Season. I can’t wait to try out recipes from the rest of the seasons. Summer includes recipes like Mean, Green Pistachio Ice Cream; Raspberry Cheesecake Popsicles (yum! ); and Red, White and Blue Layer Cake. Autumn features favorite fruits and veggies of the season, like pumpkin and apples in recipes like, Candied Apple Cookies; Cranberry Custard Pie; Stuffed Cider Donuts and Pumpkin Butter Cookies! Winter includes Chestnut Muffins; Marzipan Tea Cake; Meringue Kisses (vegan meringue?!? ); and Triple Ginger Cheesecake. Winter is followed by Components and Accompaniments, which includes recipes for Canine Cookies; Lady Fingers, Whipped Cream and more! 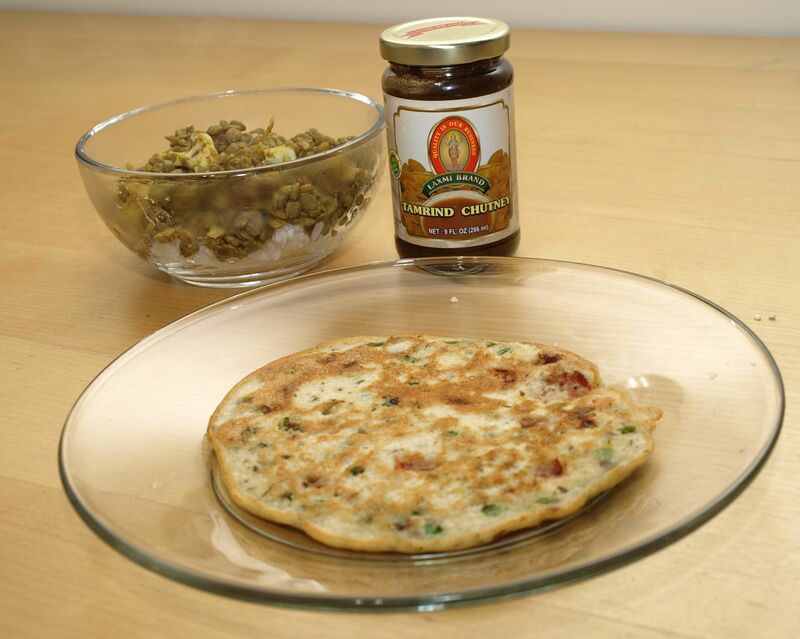 SCV: What inspired you to use ingredients more commonly found in savory cooking, like avocado and basil, in your baking? HK: I think that there are so many wonderful flavors and ingredients that are simply underutilized when it comes to desserts. So many fruits and vegetables that we might not think of as “sweet” actually have very powerful sweet flavors when coaxed through cooking and seasoning properly. It seems a shame to overlook these unique tastes, just because they’re not as familiar! There’s also that ever-present sense of seasonality that I take with me into the pastry kitchen, that pushes me to use what I have and what’s at its prime in that moment, rather than reaching for the mealy apples from cold storage in summer for example. SCV: This book focuses on the seasons. When it comes to baking, do you have a favorite season? Why? HK: Now that’s an easy one: Summer! It seems like everything is ripe and delicious all at once, with an abundance of berries, stone fruits, and so many other delicious ingredients that are practically self-contained desserts withough any further tinkering necessary. Savory chefs get more excited about Spring, what with the wild greens and baby vegetables that it brings, but summer is the height of seasonal baking in my eyes. SCV: You wrote your first cookbook (My Sweet Vegan) at an early age (she was in high school!) – how long have you been baking/cooking? HK: It’s curious to look back through my blog archives, because it ended up unintentionally chronicling my journey as a baker. As I started sharing my sweet creations about 5 years back, I started getting more and more experimental, writing my own recipes and sharing the resulting successes and failures. I was never formally taught, so it’s been a great learning experience just through trial and error, and the feedback through the blog. Cooking is in my blood though; my mom and both grandmothers are quite accomplished cooks and even before I realized that food was my passion, I was working at a vegan/vegetarian restaurant, Health in a Hurry, at age 16. It was my first job…and I still have it actually! Now I’m helping develop recipes and consult on marketing more often, but I still throw down in the restaurant kitchen at least once or twice a week these days. SCV: So far both of your cook books have focused on sweets, any plans to write a book focusing on savory recipes? SCV: I couldn’t help but notice that you included a dog treat recipe. I have yet to bake for my dogs (Ian and Harlow), but can’t wait to try it. Do you have a furry friend? If so, what’s their favorite treat? HK: Yes, I make a point to always include at least one treat for our canine friends in each of my cookbooks! My constant companion is Isis, a sweet little Basenji, who is always willing to “help” clean up my edible messes, so it seems only fair that I reward her with a little something special every now and then. She’s not terribly picky, but some of her favorite morsels are actually cucumbers – stems, peels, pieces, anything! I guess I’m lucky she has such healthy preferences. Preheat oven to 350 F and grease a 9 x 5 inch loaf pan. With your stand mixer, cream the margarine and both sugars together thoroughly. Mix together the flour, baking soda and powder, salt, and cinammon in a separate bowl. Slowly add in the dry mix, giving the mixer time to catch up and incorporate the new ingredients. Mix until mostly smooth, but don’t go crazy and overdo it; a few lumps are just fine. Squeeze the shredded zucchini lightly to remove some of the excess water, and add that in along with the soymilk, vinegar and vanilla. Divide the batter, pouring half into a separate bowl. Add cocoa powder and chocolate chips to one half and mix so that it’s smooth and homogeneous. Add alternate dollops of the plain and chocolate batter into your prepared pan until both are used up, and then run a spatula through the whole thing to lightly marble the two together. Bake until wooden skewer inserted into the center comes out clean, about 50-60 minutes. Cool in the pan for 10 minutes before turning out and moving to a wire rack. When I was a little girl in Mexico, my aunt used to make a type of sweet tamales called canarios (canaries). This cake tastes exactly like my aunts tamales. For a more authentic Mexican dessert you can add raisins to the batter and serve it without a topping as a pound cake or you can glaze the cake with pineapple cooked with sugar. It’s a very versatile cake. I live with a chocoholic which is why I top mine with chocolate mousse and a raspberry or two. Preheat oven to 350 F. In a large mixing bowl, mix oil, egg replacer, vanilla flavor, almond flavor and sugar. Add flour, baking powder, salt, almond milk and water. Mix everything together and pour batter into a greased 8in square pan. Bake for 35-45 minutes (or until a toothpick inserted in the middle comes out clean). Place on cooling rack and move on to mousse. Blend the tofu, maple syrup, almond milk and vanilla together. Melt chocolate chips in a double boiler, add to tofu mix and bend. 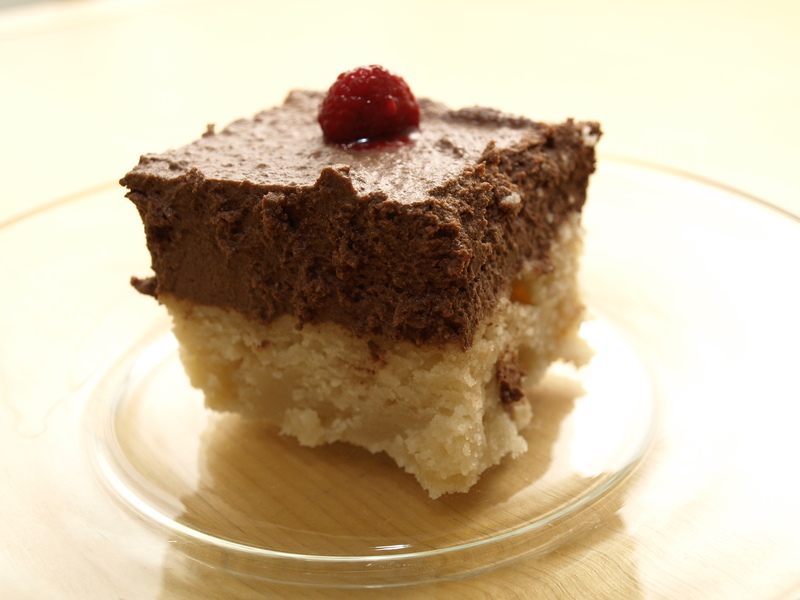 Cover cake evenly and refrigerate for 6-8 hours in order for the mousse to set. Garnish with some strawberries or raspberries and serve. 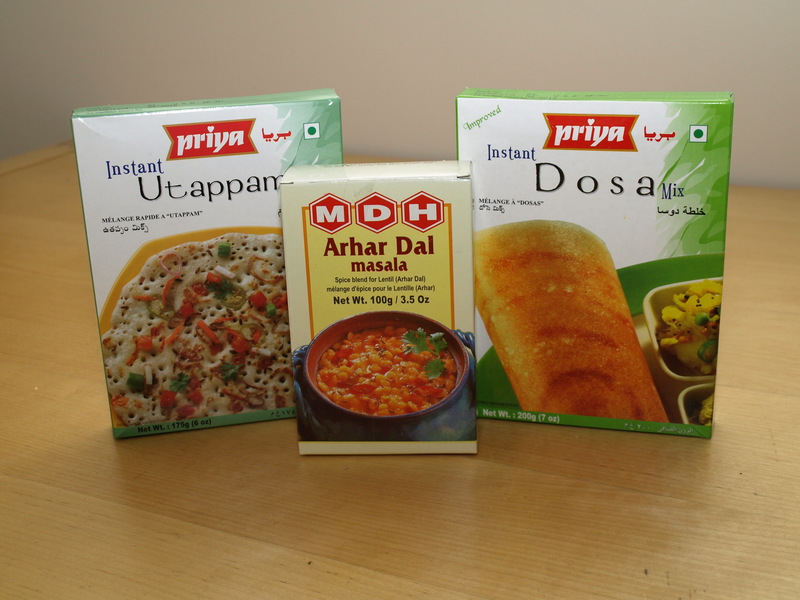 On a recent trip to Assi Plaza (8901 North Milwaukee Avenue) in Niles I found some pre-packaged vegan mixes for various Indian dishes, including Uttapam and Dal. I’ve never made Indian food before, so I figured pre-packaged might be my best bet for now, plus it wasn’t as daunting as some of the recipes I’ve found for vegan Indian food (though despite their complexity, I still plan on making vegan samosas from scratch someday). I had to guess at some of the measurements for various ingredients since almost everything on the packaging was in millileters, but the end results were delicious! 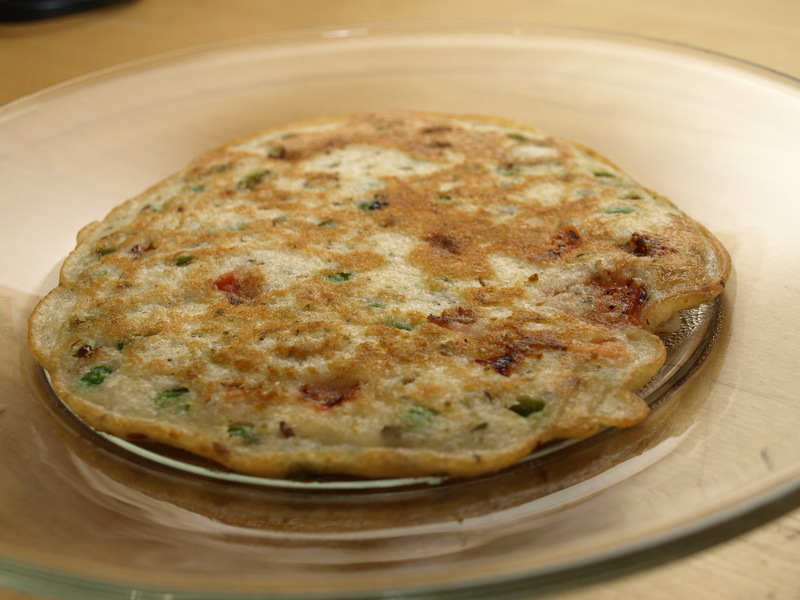 Uttapam:The Uttapam mix came with a pack of dehydrated vegetables to put in it, but I’m not a fan of dehydrated vegatables so I used fresh and frozen veggies instead. Follow the instructions on the box to mix the batter. Once batter is mixed add the vegetables and mix in. Pour about 2 Tbsp of olive oil into a frying pan. Coat the bottom of the pan with oil then pour in Uttapam batter as though you were making pancakes. Allow Uttapam to brown on one side, then flip. Once the other other side is cooked, transfer to a plate and make next Uttapam. The batter in the box was enough for three medium or two large Uttapams. Dal:The Dal mix is simply the spices to add to the lentils and there is enough in a box for multiple meals. Cook lentils until tender. While lentils are cooking fry onion until translucent. Add tomato, cauliflower and 1/2 Tbsp of Arhar Dal Masala (spice mix). Cook vegetables with spice until they become a paste. Add the vegetables to the cooked lentils and simmer for 5 minutes. Make sure to taste for seasoning and adjust masala quantity accordingly. Note: I like spicy food, so if you like things on the milder side, start with a smaller quantity of seasoning and then adjust to your tastes.